"What is a system-versioned temporal table? 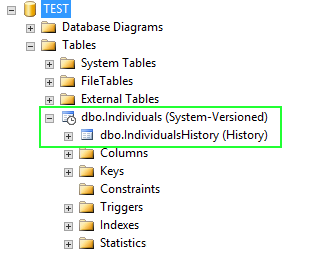 A system-versioned temporal table is a new type of user table in SQL Server 2016, designed to keep a full history of data changes and allow easy point in time analysis. This type of temporal table is referred to as a system-versioned temporal table because the period of validity for each row is managed by the system (i.e. database engine). Every temporal table has two explicitly defined columns, each with a datetime2 data type. These columns are referred to as period columns. These period columns are used exclusively by the system to record period of validity for each row whenever a row is modified. In addition to these period columns, a temporal table also contains a reference to another table with a mirrored schema. The system uses this table to automatically store the previous version of the row each time a row in the temporal table gets updated or deleted. This additional table is referred to as the history table, while the main table that stores current (actual) row versions is referred to as the current table or simply as the temporal table. During temporal table creation users can specify existing history table (must be schema compliant) or let system create default history table." - Easy querying of historical data states with a new T-SQL syntax. Can even bridge the Main table & History table. again make sure to include the History table name in that statement in order to link those tables up as before.